Tupac Shakur was fatally shot in Las Vegas at age 25, and Sept. 13 marks the rapper's 22nd death anniversary. Tupac was one of the biggest rappers of the '90s with hits like "Dear Mama," "California Love," "Ambitionz Az a Ridah," and "All Eyez on Me." On Sept. 7, 1996, Tupac attended Mike Tyson's boxing match at the MGM Grand Casino in Las Vegas. While there, he got into a fight with Crip gang member Orlando Anderson, who attempted to steal a necklace from one of Tupac's friends, a rival Blood gang member, at a local mall earlier. After leaving the match, Tupac hopped in a car with Suge Knight, the cofounder of West Coast's Death Row Records, and they headed to a nightclub. Sadly, they never made it there. On their way over, a white Cadillac pulled up next to Tupac and Suge at a red light and an unidentified man opened fire out of the back window. Tupac was shot four times - twice in the chest, once in the thigh, and once in the arm. Chris Carroll, a retired sergeant with the Las Vegas Police, was the first officer on the scene and says Tupac's body fell out of the vehicle "like he was leaning against the door" when he gained access inside the car. "I grabbed him with my left arm, and he falls into me," he recalled in an interview with Vegas Seven in 2014. "He's covered with blood, and I immediately notice that the guy's got a ton of gold on - a necklace and other jewelry - and all of the gold is covered in blood . . . I didn't realize that this is Tupac Shakur." Chris also recounted that he tried to get a "dying declaration" from Tupac, but instead, the only words that came out were "F*ck you." Moments later, Tupac slipped out of consciousness and he was rushed to the hospital. "As soon as he got to the hospital, he went into surgery and was heavily sedated, and I guess he went into a coma and really never came out of that until they took him off life support," Chris revealed. "I talked to the cop who rode in the ambulance with him. He said Tupac never came out of [the coma], and he never said anything at the hospital. There was nothing else." Six days after the shooting, on Sept. 13, Tupac died of internal bleeding. To this day, nobody has ever been charged for the murder of Tupac, but the Los Angeles Police Department believes "it was a gang retaliation murder." 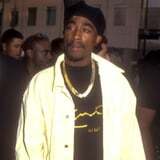 Tupac had been involved in the '90s East-West Coast rap label feud with Notorious B.I.G, who was murdered six months later. Others believe that Suge might have been involved because Tupac "was trying to leave Death Row and start his own label," though Las Vegas Police Department detective Dan Long disagrees solely because Suge was also a victim. "After Tupac was shot, the next day there were murders all the way back in LA because the Compton Mob Piru (which Suge was a part of) knew that the Southside Compton Crips were involved." The case still remains open.